Corydalis ‘Porcelain Blue’: True blue flowers are not easy to find and we’re sure you’ll love this eye-catching plant almost as much as the pollinators it attracts. It blooms from spring to early summer (April – June) and makes a great addition to a garden border or planted in a container. The plant is surprisingly robust despite its delicate appearance and it does well in both sun and partial shade. It’s hardy in Zones 5 to 8. Double Zahara Raspberry Ripple Zinnia: This flower is disease-resistant and its pink and white blooms will have a dramatic impact in your garden. Cooler temperatures accentuate its pink color and when warmer temperatures arrive, the white color becomes more pronounced. It blooms from spring through autumn and does well in sunny, hot and dry conditions. Ornamental Oregano Kirigami: An intriguing non-culinary oregano that has large purple-green bracts, rose flowers and clear, light green foliage. 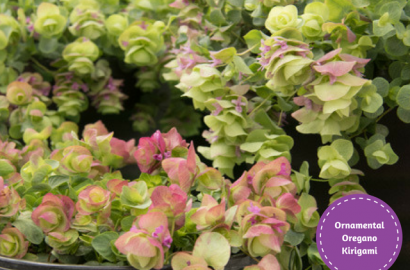 Its wonderful fragrance attracts pollinators to your yard and Kirigami is perfect in patio containers, hanging baskets or window boxes where it can be viewed all season long. Sunnier conditions and cooler temperatures accentuate its purple bract color. It is a perennial and hardy for Zones 5 to 8. 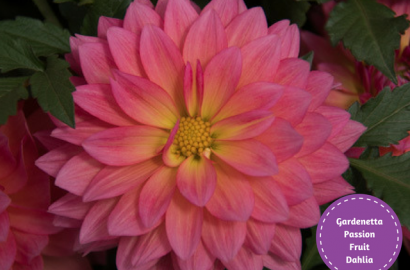 Gardenetta™ Passion Fruit Dahlia: Dahlias are one of our favorite flowers so you will typically find them on many of the “top ten” lists we do. 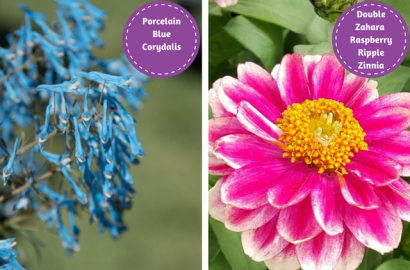 This Dahlia features big blooms and is powdery mildew resistant. It does well in containers or as a border plant and loves the summer heat. This is a great plant to have for late season blooms. 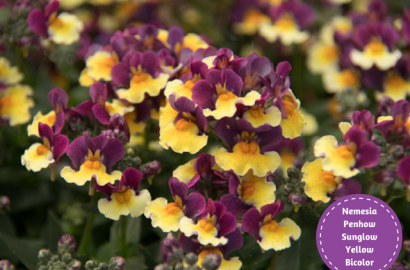 Nemesia Penhow® Sunglow™ Yellow Bicolor: This early spring bloomer adds gorgeous color and a sweet fragrance to your spring garden. The bi-color flower has yellow petals with light yellow edges and flashes of deep orange circle an inner layer of plum burgundy. It does well in containers and prefers full to partial sun. 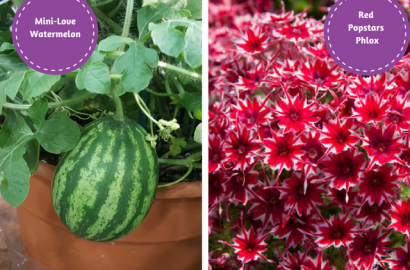 Mini-Love Watermelon: This reduced sized watermelon is perfect for smaller yards or container gardens. The compact plants can yield up to 6 fruit per plant and each fruit can weigh up to 9 lbs. The crisp, deep red, juicy flesh has a sweet, refreshing flavor and very few seeds. Mini-Love Watermelon is a true summer delight for watermelon lovers. Red Popstars Phlox: This new variety has star-shaped bi-color blooms. It was one of our favorites at the spring trials! They look great in containers and bloom from June through August. Red Popstars are easy to grow, hardy, self-cleaning and do well in all kinds of weather. 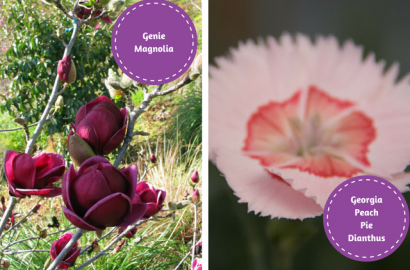 Genie Magnolia: This Magnolia is a compact tree with eye-catching scented blooms of a rich maroon-purple shade. The flowers are tulip-shaped and measure 6-inches across. This Magnolia blossoms primarily in the spring but if there is adequate moisture it can bloom longer. A fan of full to partial shade this plant does best in consistently moist, acidic, organically rich, well-drained soils. It’s a great choice for urban or cottage gardens. Hardiness Zones 5-9. Georgia Peach Pie Dianthus: This plant’s beautiful hybrid pink flowers are only rivaled by its stunning aroma. This plant has sturdy stems that do not flop and it is sun-tolerant and attracts hummingbirds. Use this plant in containers, garden borders or as a cut flower. Hardiness Zones 5-9. Blushing Beauty Osteospermum: This exciting bi-color flower is golden yellow with a purple/pink center. This flower will look beautiful in the summer sun. Try pairing this plant with the Blue Eyed Beauty which matches well in habit and the timing of its bloom cycle. Hardiness Zones 9-11. Confetti Hydrangea Paniculata: Confetti has lightly scented 10" flowers panicles that are multicolored with a mix of white, pink and chartreuse-green. The white flowers turn pink as the season progresses and the blooms are prevalent from early summer to late autumn. If left unpruned the dried flowers provide an interesting focal point in the winter garden. This is a smaller hydrangea variety and great for tight spaces. It grows best where the shrub gets morning sun and afternoon shade. Attracts butterflies and hummingbirds. Hardiness Zones 4-9. 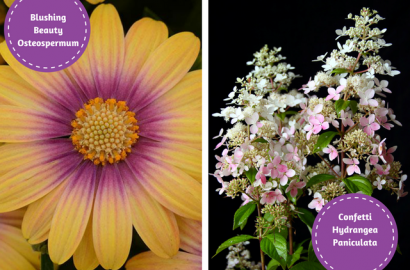 Let us know if you try growing any of these this year!